In this article, we break down the calculations behind the referral rewards system at Solomon Mines. You can find out how much you can earn by learning the following formulas and examples. You earn income every time a new personal referral enters the system by buying gold and each 92 days when they extend their membership by either buying more gold or referring 5 new members. The following data is calculated based on a theoretical anticipation that all members are Individual Program members. This is the amount a referee earns each time a new member enters the system. Earnings from all Active Members are $562,415.85 every 92 days. When all Business members join the program your income can be $ 2,249,663.4. Through our referral rewards, you can create a stable passive income that will give you a peace of mind when you plan your retirement or take care of your children's future. The following examples show how much you can earn through being an active member of the Individual program. 2 * $1278 + 11% (2 * $1278 * 0,11 ) = $2837.16. It means that upon joining the club you invest $2,737.16 of which $2,556 are for the gold bars purchase and $281.16 for the maintenance fee. You get a ROI of 82% or additional 0.82 cents of profit per each dollar that you spend every 92 days when you extend your membership. You are on Level 2 "Ore" and you failed to get 5 new members, so you decide to extend your membership by buying one ounce of gold at the end of your activity period. At this moment you have 30 members in your network: 5 members in the 1st level and 25 in the 2nd level. Some of them are referred by your referee and some of them are distributed by the system as a bonus from the company. There're two possible ways of how much you can get depending on how they extend their membership (either referring more new members or buying more gold). All 30 participants fail to get 5 new members and purchase 1 ounce of gold to extend their membership. 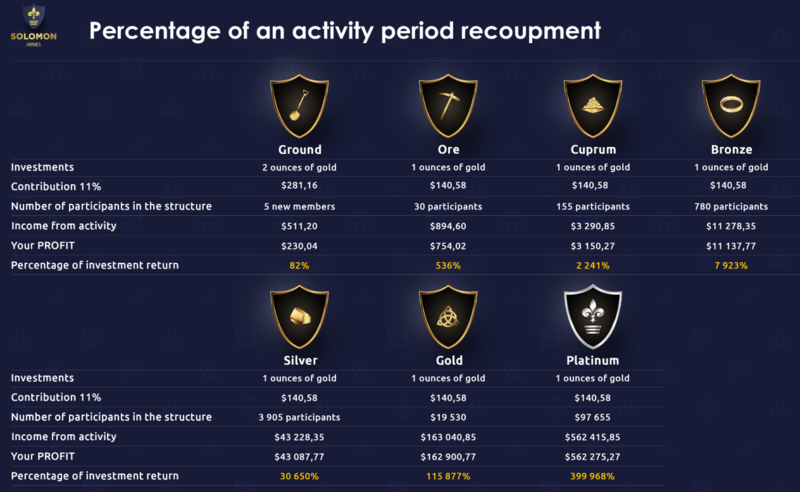 5 members in the 1st level extend their membership twice by buying more gold while 25 new members in the 2nd Level purchase 2 ounces of gold. All of your referrals are members of the Individual program. It looks more and more attractive with each level. Imagine you're at the 3rd level "Copper". 125 new active members were added to your network. Some of them are referred by your referee and some of them are distributed by the system as a bonus from the company. All 155 active members extended their membership by purchasing 1 ounce of gold. 5 members in the 1st level and 25 members in the 2nd level extend their membership twice by buying 2 ounces of gold each while 125 new members join the club by buying 2 ounces as well. All of your referrals are members of the Individual program.